While we were in Pacific Grove over the summer, Tristan celebrated his 8th birthday in two amazing ways. 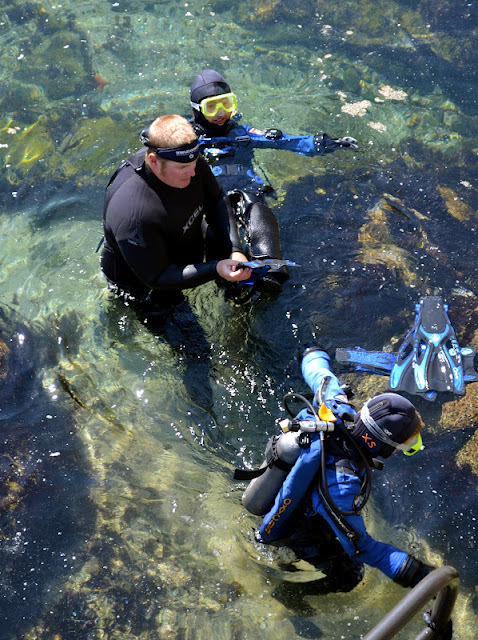 First was his scuba diving experience at the Monterey Bay Aquarium where he fearlessly braved 50 degree water and explored the great tide pool outfitted in his wetsuit and oxygen gear. And second, he enjoyed his first taste of a chocolate cake with chocolate ganache, baked with love and customized by Stephanie Stein at Happy Girl Kitchen Company. Stephanie Stein's egg, dairy, and nut-free masterpiece delighted the socks off the kids! Tristan posing for his Scuba Diary photo--way cool, dude! 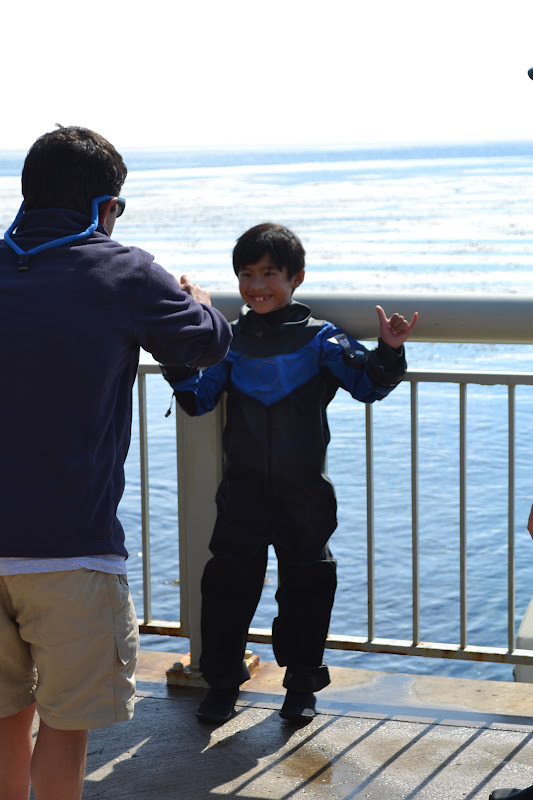 Putting on your fins in the water is no easy task! I was hesitant to order a cake with chocolate ganache, as the kids (minus my little frosting-eating monster in pigtails) usually complain about too-sweet frosting. But Stephanie, lovely as she is, said she could use less sugar in the ganache and promised the cake would be delicious. More like sinful. The kids loved it so much! OK, I might have had my share of the cake as well. In light of these events, I decided to try my hand at making chocolate ganache. Heart-healthy Cathy over at what would cathy eat? had the perfect recipe for a first timer like me. The cake is a variation on wacky cake, my go-to for party cakes and cupcakes. She adds coffee instead of water or milk (Did someone say coffee...in my chocolate cake? Brilliant.) With just a few ingredients in the ganache, and her almond milk easily replaced with soy milk (or any other allergy safe milk), let's just say I'll be making this cake again real soon. I used a 9 x 13 pan instead of two 8" rounds, but you could surely do a round layer cake or cupcakes instead. See Cathy's suggestions for greasing and inverting round cake pans. Find any reason to celebrate and bake a cake for your little ones this week! Vegan Chocolate Cake with Chocolate Ganache (can be made free of the top 8*), adapted from what would cathy eat? 1. Heat the oven to 350 degrees. Grease and flour your cake pan(s). (If you're using rounds, Cathy suggests greasing, putting a round piece of parchment paper at the bottom of each round, and greasing again). 2. Sift all of the dry cake ingredients into a bowl. In a separate bowl, mix together the oil, coffee, water, and vanilla extract. 3. Pour the wet ingredients into the bowl with the dry ingredients and mix to combine. Don't overmix. Stir in the vinegar, again just enough to combine. 4. Pour the batter into the pan(s) and bake for 30 minutes or until center springs back to the touch. I baked mine a little longer (like 40 minutes) but I also have an oven with a questionable temp read. Just be patient! 5. Pour ganache ingredients into a pot and warm slowly until the chocolate is melted and ingredients combined. Spread evenly over the top and sides of the cooled cake. If you're doing a layer cake, you can spread a thin layer between. 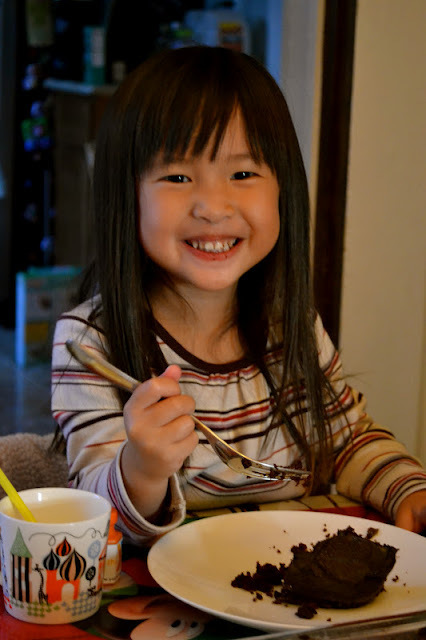 Go ahead, put a chocolate-toothed smile on your kids' faces this week with this decadent cake. We at GAW are helping out with the Bay Area's FAAN Food Allergy Walk. Walk organizer Brian Hom has been working tirelessly to spread awareness about the dangers of food allergies. His recent targets for change have been sporting events. 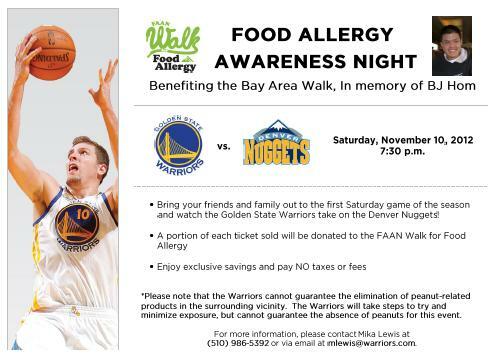 Brian was happy to share with us that the Golden State Warriors have designated their November 10th home game as Food Allergy Awareness Night. The Golden State Warriors will be allocating a peanut-free section of approximately 160 seats. A portion of every ticket sold in this section will be donated to the Bay Area's FAAN BJ Hom Memorial Walk. Please note that while efforts will be made to pre-clean the area and discourage the consumption of peanuts in these sections, the Warriors management cannot guarantee that the area will remain completely safe from peanut exposure. It is also important to note that the Golden State Warriors have a "no-outside-food" policy. If you are a parent to kids with multiple food allergies, you're likely pack along food for wherever you go. (At least I do!) If you plan to attend the game but worry about the food rules, plan to have your kids eat filling meals before the game. (Game time is 7:30pm but doors open at 6:00pm.) If you want to try to bring along safe snacks, be sure to bring a letter from your allergist that confirms your child's food allergy diagnosis and the necessity for you to carry safe foods and medication for travel. I honestly don't know if arena security will relax their rules for food-allergic guests but having a doctor's letter might help. And of course, bring your EpiPens! This is the first time an NBA organization is supporting a peanut-free cheering area, a big step for food allergy advocacy. Thanks to some dedicated fans, the San Francisco Giants recently hosted a successful peanut-free zone at their August 26th game against the Braves. The Giants event was very successful, the organization would like to plan more peanut-free zones for their 2013 season. With more professional sports teams accommodating the needs of their food-sensitive fans, there is hope for more public awareness about the prevalence and dangers of food allergies...and more hope for safer, enjoyable public outings for all! For the latest information on the Bay Area's FAAN walk and related fundraising events such as the Golden State Warriors game, check out the group's Facebook page. And be sure to reserve your tickets through Mika Lewis! Allergy-friendly company Enjoy Life Foods was one of our generous sponsors from last year's Food Allergies Rock concert event. Recently the company reached out to us to see if we would be interested in trying out a new chip. Would my milk-allergic, nut-allergic kids like to try some new snacks? Um. YES!! Enjoy Life's newest addition, Plentils, is a line of snack chips that uses lentil flour as a key ingredient. Like their other products, Plentils are free of the top 8 allergens -- milk, egg, soy, wheat, fish, shellfish, peanuts, and tree nuts. It is also gluten-free and free of any artificial flavors. We received a sample of four Plentil flavors: margherita pizza, sour cream and dill, garlic & parmesan, and light sea salt. Now, my kids have never tried a lot of the popular chip brands and flavors. This is in part due to their food allergies and in part because I try to avoid buying a lot of junk food. Never have the boys eaten Doritos or Pringles' or Lay's Sour Cream and Onion, snacks that were standard munchies in my husband's and my own teenage and 20-something years. My kids were pretty excited to try Plentils. Heck, I was pretty excited to try them! I wanted to know if it was possible to have a healthier and allergy-friendly chip that was a flavor substitute for the usual party snack. The first two flavors we tried were the Dill & Sour Cream and Margherita Pizza. Why these two, you ask? Well, if you must know I used to love Sour Cream & Onion chips as a kid and my husband is a recovering Doritos addict. My well-trained and ultra-cautious (bless his allergic heart) son, Ryken, kept asking me, "Mommy, are these safe? It says 'cream' and 'pizza'...'parmesan'?!?!" I read and reread the labels twice and gave the bags to him for his own inspection. I have been having Ryken double check labels since he is a proficient reader and want to reinforce his responsibility in ensuring his own safety. No milk, no nuts. Sorry for the shirtless chip models. It's been a sweaty September! The safety check out of the way, we broke open the bags and away we munched. The lentils were crisp and light although definitely thicker than a typical corn-based or potato-based chip. Both varieties were flavorful without being too overpowering. Ryken, who usually doesn't like most beans, was surprised that these contained lentil flour. He rechecked the label in disbelief. Plentils definitely didn't leave the same powdery residue that I remember from bright orange Doritos or flavored Pringles. Overall, the kids liked the dill sour cream and the margherita pizza but, without question, they liked the pizza-flavored chips best. My husband and I agreed that the pizza flavor was reminiscent of Doritos! Incidentally I also sampled the Garlic & Parmesan flavor just before posting this review. My first reaction: Funyuns. And that's a good thing in my book! The seasonings made these Plentils looks like Cool Ranch Doritos. Enjoy Life's product website discusses the use of lentils to create a more nutritious snack. The company touts lentils as an excellent source of protein, fiber, vitamins, and minerals including folate, thiamine, and iron to name a few. However, in checking out the nutritional information on the Plentils packaging, there was very little listed about the mineral and vitamin content. The standard calcium, iron, vitamins A and C are listed but there is only 4 percent of iron per 1-ounce serving size. I was surprised to see that the chip doesn't have a lot of fiber (1 gram per serving) and it contains 6 grams of fat and roughly 130 calories per 1 ounce serving. Each serving contains 3 grams of protein compared to 2 grams in Dorito's or Lay's Potato Chips. It is true, as Enjoy Life's website states, that the fat content is roughly 40 percent less than that of potato chips. However, Plentils' calorie count and fat are only slightly less than Doritos. Just because it uses lentil flour does not mean Plentils should be regarded as a health food; but they are a bit healthier that the other chips out there in part because of its natural flavors. Overall, we liked Plentils and think Enjoy Life succeeded in creating a safe and appealing snack chip. Subtle and tasty, Plentils will be a nice option for a special treat or party food for my kids. Yay! Labor Day has arrived, which means three whole mornings of sleeping in and letting the chaos ensue. But still. Three whole mornings. Boo...I've seemed to have contracted a stomach bug that latched on at around 1 am, and is relentless. Argh. Even more reason to get some extra sleep this weekend. With this crazy weather we've had for the past week, 70's blue sky, followed by days of 50's high temps, in combination with this weak stomach, I decided to try out my cousin's chicken pho recipe. My latest obsession, chicken pho from Turtle Tower, has been my go-to take-out meal for the past several months. Delicious broth, slippery rice noodles, juicy chicken, topped with cilantro, green onions, and bean sprouts...how can you go wrong? Well, the fact remains that most Asian restaurants in the City cook with MSG. Once, I had dared ask a server at a local Vietnamese restaurant if their pho had MSG, and he responded with a chuckle, "Of course." OK not so bad once in a while unless your daughter drinks pho broth through a straw and calls it a meal. Ky-Yen's brother, Ky-Wai, passed this recipe along to her and it is apparently a fan favorite at his house among his triplets. Yes, I said triplets. Not only that, Ky-Wai is a classically trained chef. How can you not try this recipe? It's a very easy recipe, with the hardest part being finding the MSG-free pho spice bag that Ky-Yen uses in the recipe. I checked a few Clement St. shops, and they didn't have it (or at least I didn't see it), so I ventured across the park to Sunset Super on Irving St. to find it. I am wondering if they also carry it at the bigger Asian markets like 99 Ranch. Here is, simply, the recipe Ky-Yen sent me. Mine is cooking on the stove right now, and I must say, it smells authentically Vietnamese in our house right now. Aw yeah. Would be perfect with Irene's latest find from TJ's--fresh rice noodles. Pho Spice, available at Sunset Super, contains cloves, fennel, and star anise--NO MSG!!! 1. Cook the broth ingredients for 1 hour in a large pot. I made it with two yellow chickens from the Asian market. They have less meat but are also known to be less fatty and more flavorful. 2. 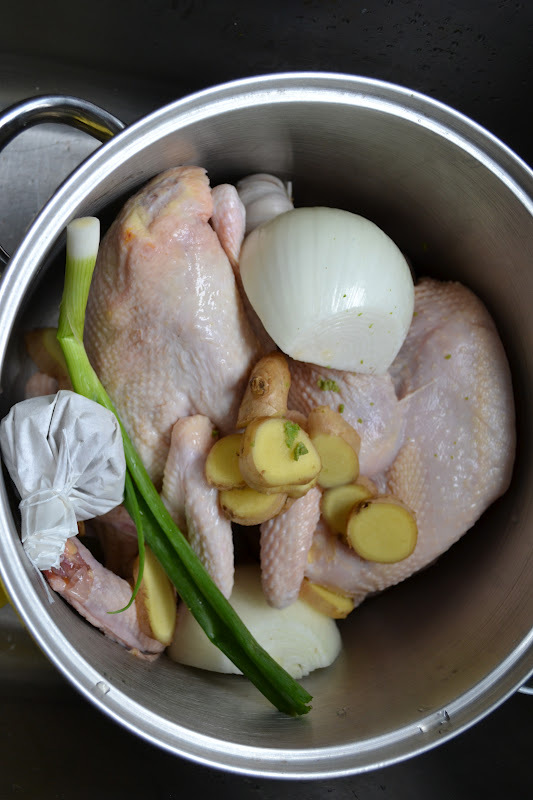 Drain, and set aside chicken on a plate, saving the broth in the pot. Compost the spice bag, garlic, ginger, scallion, and onion. 4. Cook noodles according to bag directions. 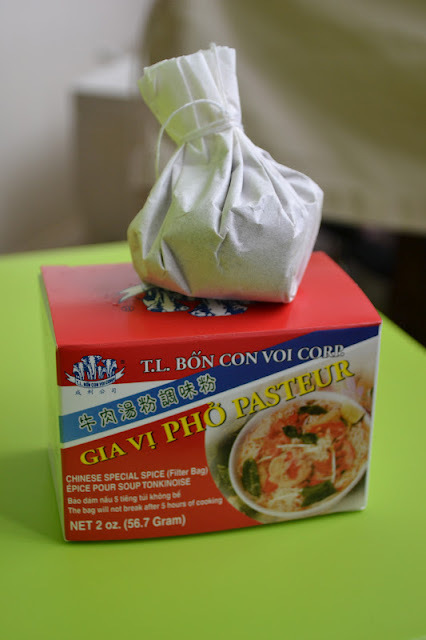 I used fresh pho noodles, but there are lots of alternatives based on taste and allergies. 6. Add noodles, broth, and shredded chicken to a bowl. Garnish with desired toppings, like bean sprouts, chopped cilantro and scallions, Thai basil, lemon juice, and sliced and seeded jalapenos. 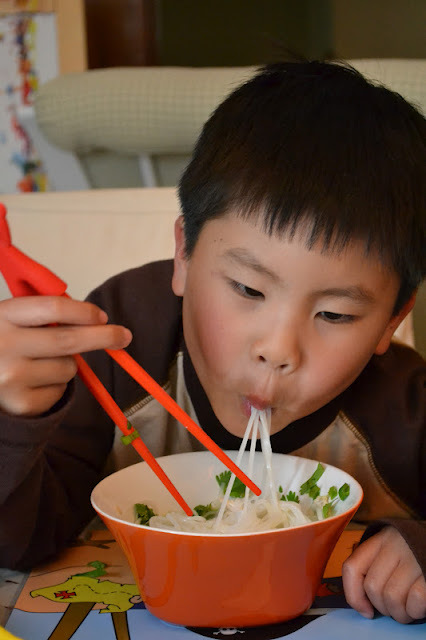 The fine art of slurping your noodles. 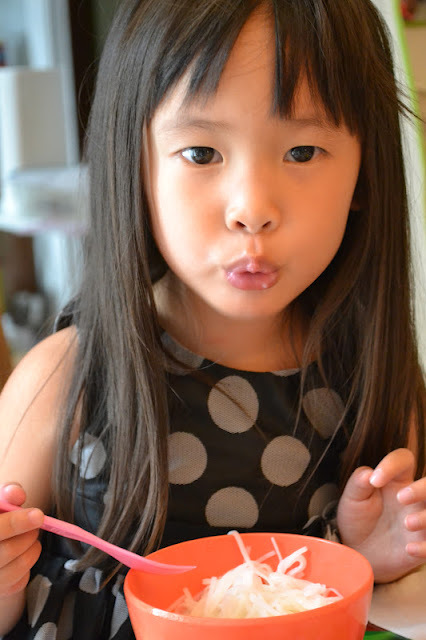 Most little girls would not wear a party dress to eat their pho, but the broth smelled so good the kids came running to the table, and this one refused to change out of her dress.